Over the last month or two, I have been learning to read again, but in a whole different way – reading colour rings on birds legs! A bit of a specialised skill, I must admit, which involves spending a considerable amount of time standing in one place, staring at birds’ legs through a powerful telescope, looking for coloured bands, which sometimes have letters / numbers inscribed on the ring. It’s a tad embarrassing, but I do get a rush of excitement when I spot a colour ring and huge satisfaction when I finally get all the details! If you are wondering WHY birds get bling like this the BTO explains it all here. And if you happen to see a bird with bling, please tell someone about it – here’s how. 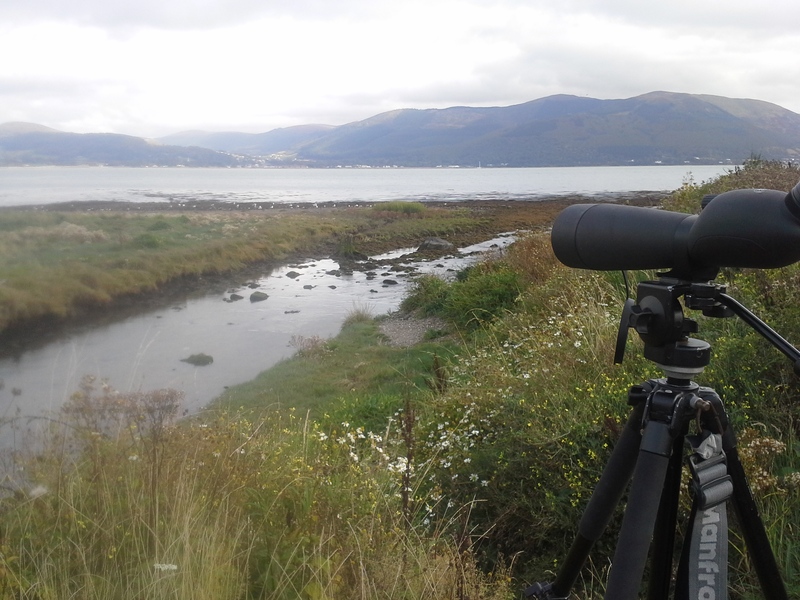 At Omeath, on the south side of Carlingford lough, close to the newly established Greenway, which I must find time to explore properly, I stopped to examine a mixed flock of birds roosting (chilling out, pruning etc.) at the waters edge. I scanned through the birds and was thrilled to spot a blue colour ring on a Common Gull (Larus canus), which I eventually read as 2AHX. I sent the details to Shane Wolsey from the BTO in Northern Ireland and he was able to tell me that 2AHX was ringed on Copeland Island on the 29th of June 2013 as a pullus (chick). This was the first time the bird has been seen since! Common Gull 2AHX ringed at Copeland Island (blue) and re-sighted at Omeath (red) a distance of ca. 84km. 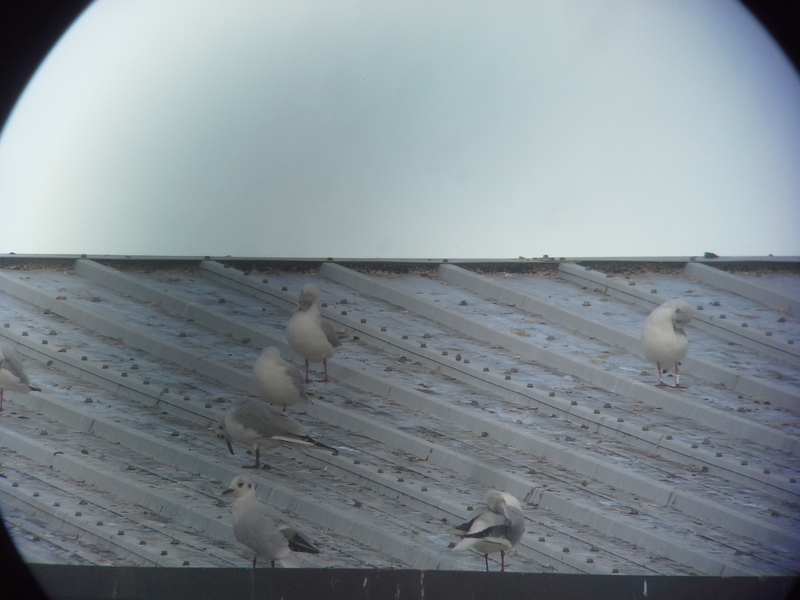 Just across the water in Warrenpoint, I spied a large gathering of gulls on the roof of a warehouse close to the harbour. Before the morning traffic started, I set up the scope on the footpath in the middle of town and began searching through hundreds of legs for a splash of colour. My heart skipped a beat (is this sad?!) 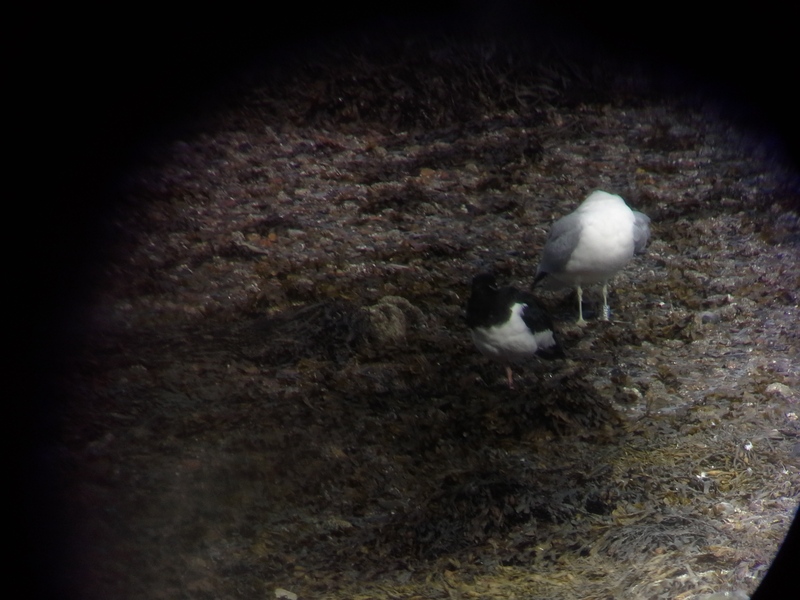 as I spotted a white band on the red-ish leg of a Black-headed Gull (Larus ridibundus). I edged closer, being careful not to get run over, and with a bit of patience and a lot of luck, I managed to read the ring – T5J4. Black-headed Gull T5J4 (top right) at Warrenpoint Harbour. After asking some local ringers which scheme this bird might belong to, details were sent off to the Polish Ringing Scheme in Gdansk. 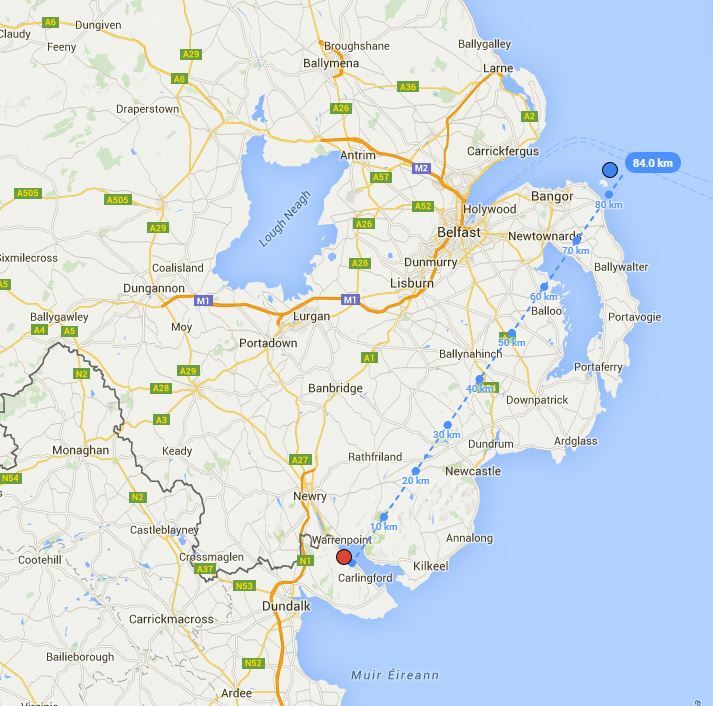 It turns out this bird was ringed on the 5th of June 2011 as a pullus (chick) and has travelled almost 1,550 km to Warrenpoint – the point obviously has a lot to offer! Black-headed gulls which breed in northern Europe and around the Baltic Sea migrate to western Europe (including Ireland and the UK) for the winter. Check out bhgullsni for all the news on Black-headed gulls in Northern Ireland! 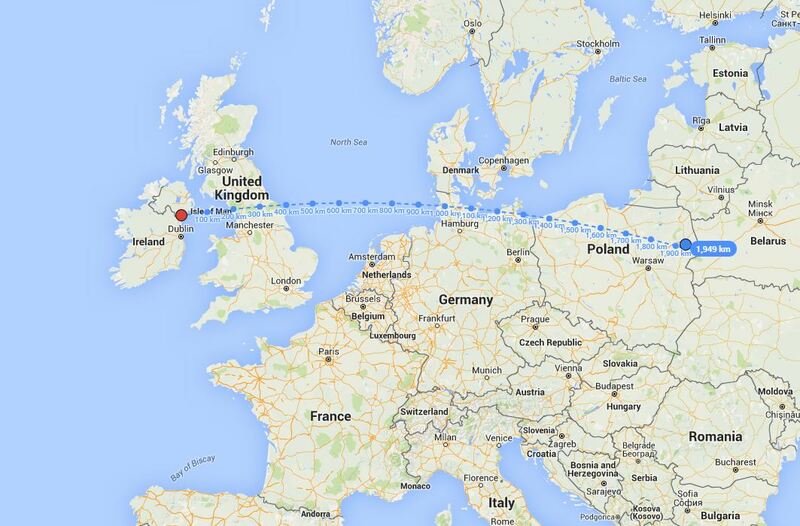 Black-headed Gull T5J4 ringed in eastern Poland (blue) and re-sighted in Warrenpoint (red) a distance of almost 1,550km.